Zinke Finds Lewis' Platform "Ironic"
Zinke's Communications Director, Shelby Demars, says Lewis’ plan to clean up congress sounds good on paper but due to his history with former U-S Senator Max Baucus finds it highly unlikely. Rep. Tom Cotton (R., Ark.) holds a four-point lead over Sen. Mark Pryor (D., Ark.) in the 2014 Senate race, according to new polling by Impact Management. Cotton leads Pryor 47 to 43. ABC News Anchor Diane Sawyer makes a major flub. A federal judge on Thursday ordered the IRS to detail under oath how some of former agency official Lois Lerner’s emails went missing, as well as any potential methods for recovering them. 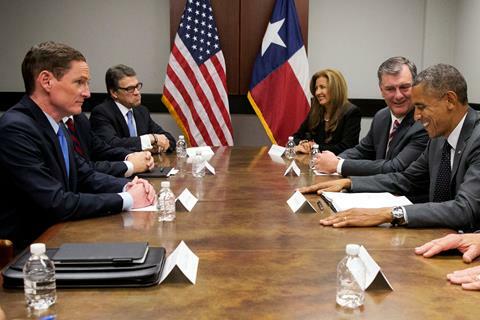 Watch Governor Perry's interview here. Glen Beck's Trip to the Border. Help SOFA win the battle for America! Any amount counts. Your generosity to the cause is greatly appreciate. Donate now!